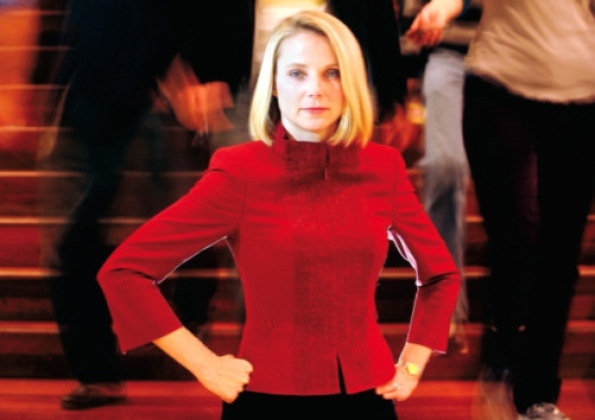 Pregnant Marissa Mayer got the top job at Yahoo – is she the future or a blast from the past? IN THE data torrents of computer code which power the world’s most ubiquitous websites, a single random digit can crash a system or throw a household name offline. No-one knows that better than Marissa Mayer, the newly appointed CEO of ­Yahoo. At the beginning of last week, Mayer was the 37-year-old high-flier whose appointment to the top job at Yahoo had just capped a Silicon Valley dream ­career at Google. Former colleagues lined up to heap praise on the computer engineer. Working women delighted in the fact that a woman had just taken a top job in an industry dominated by nerdy men. But then came the nugget of data that changed the tone of the conversation; Mayer is due to have her first child in October. And she intends to work through her maternity leave. Overnight the technology superhero, riding in to save the troubled internet giant, became an over-achieving hate figure, demonised for her lack of maternal feeling and patronised for underestimating the challenges of motherhood. Mayer has praised Yahoo for “their evolved thinking” in not questioning her about her pregnancy during the recruitment process. So is Mayer an inspirational figure smashing a double-glazed glass ceiling and soaring to the top while pregnant, or is she a self-absorbed careerist blind to the life-changing challenge which motherhood is about to hand her? This entry was posted in Interviews, Features & Arts, News, Politics & Current Affairs and tagged Claire Prentice, Claireprentice, Marissa Mayer, maternity leave, The Lost Tribe of Coney Island, women and work, women's rights, working and maternity leave, Yahoo, Yahoo CEO. Bookmark the permalink.